Stuff required: Bouncy head boppers for each player (a different colour for each team - three teams is ideal). Large flowers (felt or paper is fine). Pollen - we used small yellow lumps of plastic intended for floristry weights. A "hive" for each team - something with many divisions, each big enough to accommodate one piece of pollen (egg cartons, cupcake pans, a piece of paper with lots of square drawn on it...). Double-sided tape. Place required: Large outdoors area. Activities: Running, finding, music, child-friendly, teamwork. 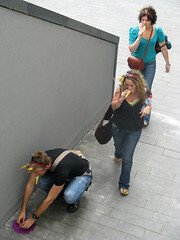 Three teams of bees hunt for pollen, armed only with kazoos and bouncy head boppers. Choose a large area with clear boundaries. A park, a pedestrianised area, even a large building (if you're allowed to run in it) could be suitable. There should be a base within the area, where the hives are kept. Make a number of flowers, and stick yellow stones, or "pollen", to each one - anywhere between one grain and ten on each flower. Stick these around the playing area, using the double-sided tape. Don't hide them too well: some on the ground beside benches, some up walls, some on benches. There should be about 150% as many pieces of pollen as there are holes in all three hives combined. Set the hives out in the place you're using as a base. Gather the players together and divide them into three teams, then hand out the head boppers. Each team should have its own colour of head bopper. Give each player a kazoo, as well; ideally these would match the head boppers, but it doesn't really matter if they don't. Explain the instructions for players (below) to the players, then send them off to collect pollen. Stand guard over the hives to make sure everyone adheres to the rules. Put on your bouncy head boppers; ready your kazoo. The team who fills up its hive first is the winner. Naturally, you'll therefore want to guide your fellow hive-members to any flowers that you've found (assuming they still have pollen in them). However, as a bee, you can't talk: you can only play your kazoo, or make gestures. The idea is that, like bees, you will buzz and communicate to fellow team members through movement. 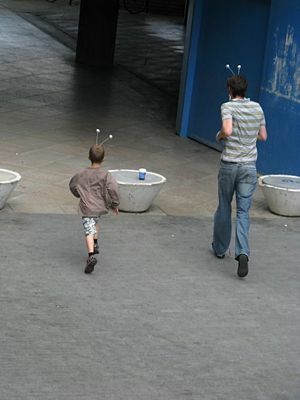 Bees was first played at Hide and Seek 2008, and was run for children as Be a Bee at the Southbank Centre's Festival of Food in September 2008. This page was last modified on 3 May 2009, at 17:10. This page has been accessed 20,356 times.